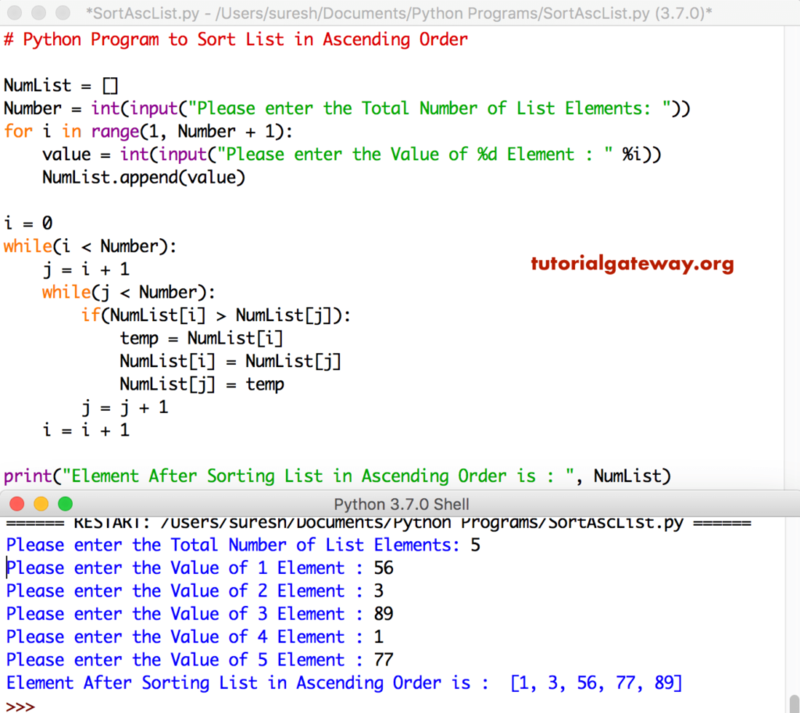 In this article, we will show you, How to write a Python Program to Sort List in Ascending Order with practical example. Before you start, please refer List article to understand everything about Lists. This python program will allow a user to enter any integer value. This is a length of a List. Next, we used For Loop to add numbers to the list. In this program, we are using Nested For Loop to iterate each and every number in a List, and sort them in ascending order. It means, Condition is False. So, it will exit from If block, and j value will be incremented by 1. Now the List will be 34 86 67 55. Next, j will be increment by 1.
if(34 > 55) – Condition is False. So, compiler exit from the If block, and j value will be 4. Next, i value will be incremented by 1. This program is same as above. However, we replaced For Loop with While loop.